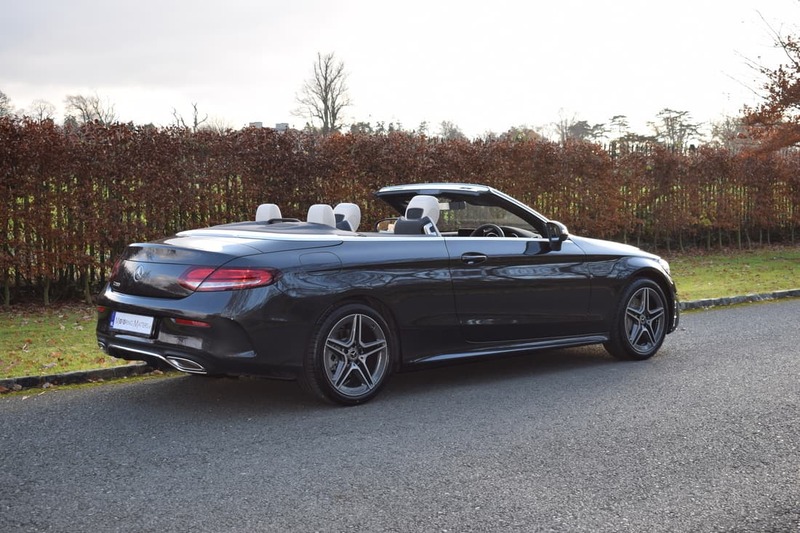 Stunning New Mercedes-Benz C-Class Cabriolet. 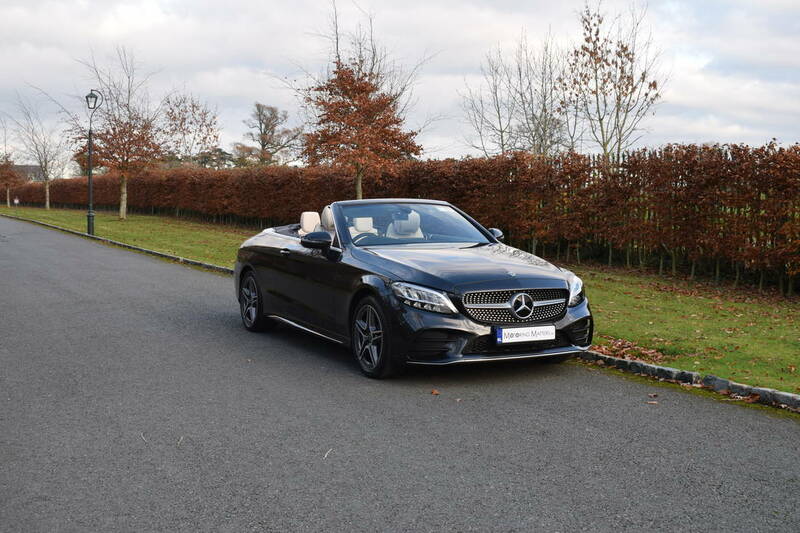 The new Mercedes C-Class Cabriolet is a superbly refined and beautifully crafted convertible. 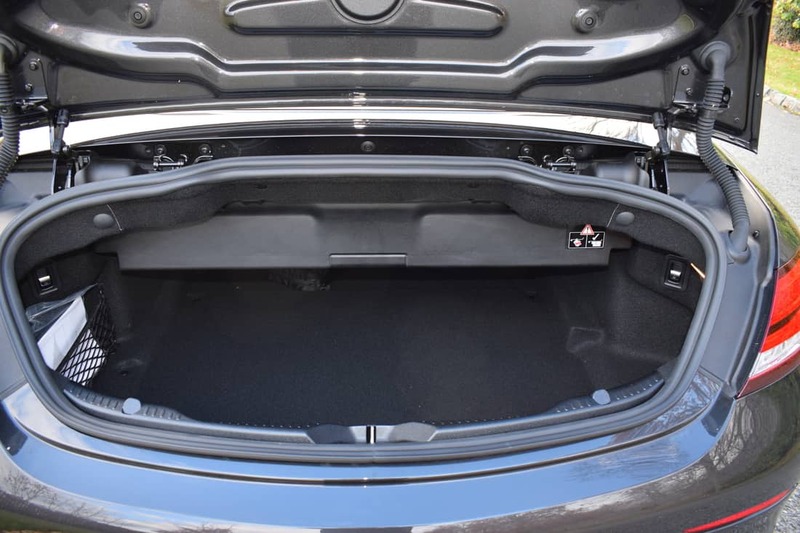 When cruising with the electrically operated roof down, the C-Class excels. 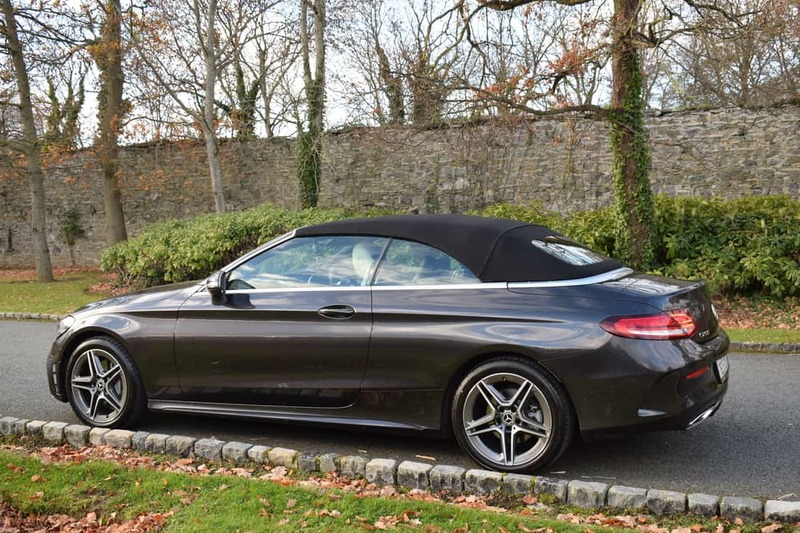 The roof can open and close seamlessly in around 19 seconds, while Mercedes includes extras such as a rear wind deflector and special windscreen rail that’s designed to reduce cabin buffeting when the top is down. 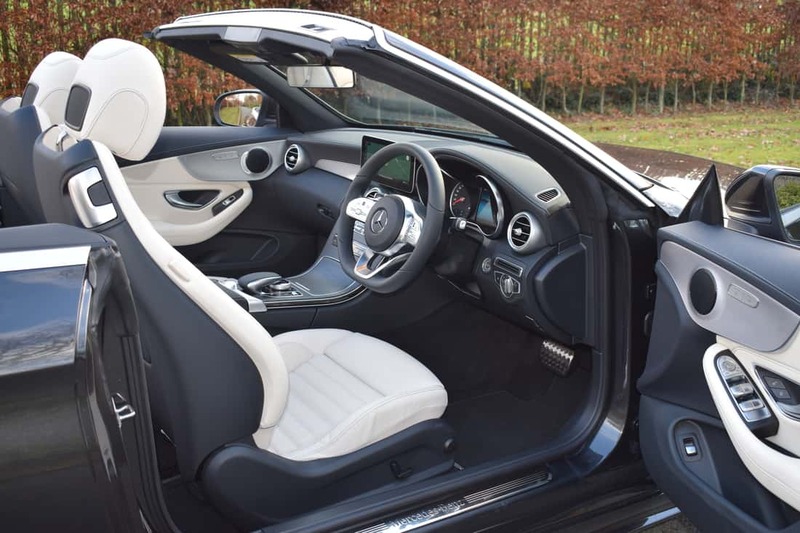 The C-Class Cabriolet features a multi-layered fabric top that is designed to offer just as much refinement as the C-Class Coupe when it is up. 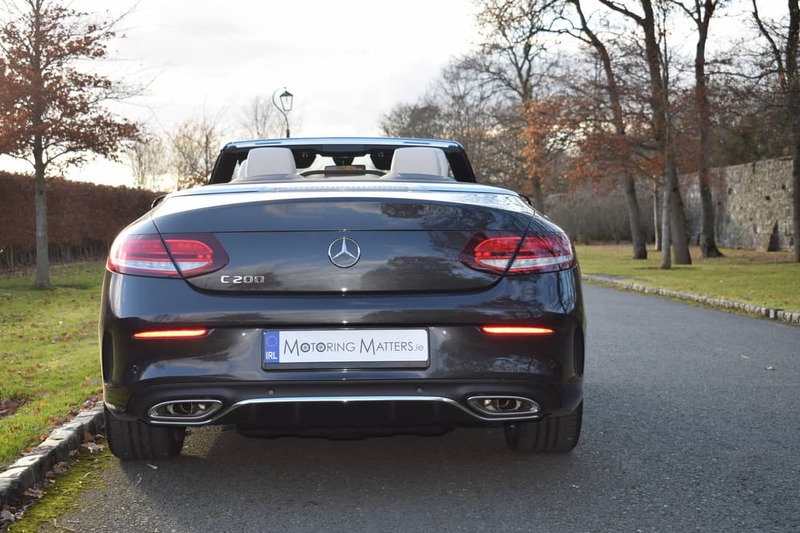 To create a car that offers as much refinement and finesse with the roof down as when the roof is up is quite remarkable, but Mercedes-Benz has carried out this brief admirably. 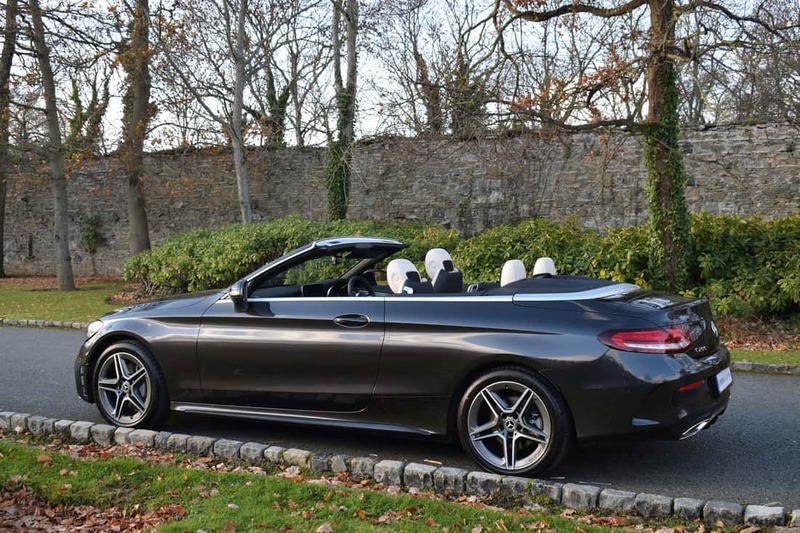 The award-winning Mercedes C-Class Cabriolet has just two rivals in its class – the Audi A5 Cabriolet and the BMW 4-Series Convertible, with the C-Class Cabriolet’s recent refresh tasked with keeping the car the top choice in the face of such talented rivals. The strikingly handsome lines and muscular surfaces of the new C-Class Cabriolet demonstrate breath-taking style. Top quality materials and class-leading ergonomics abound in the sporty-design interior, which offers exclusive comfort and room for four occupants. 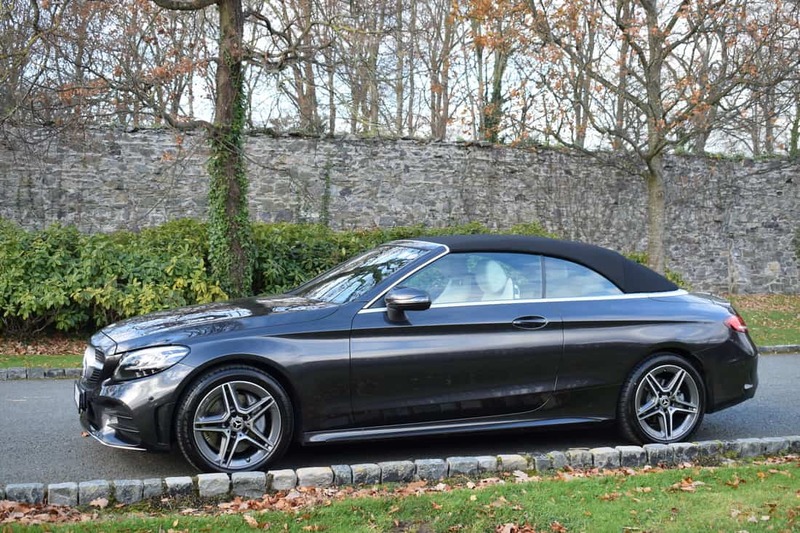 Roof-down cruising in the C-Class Cabriolet is enjoyable at any speed, courtesy of the Mercedes-Benz AIRCAP® system. 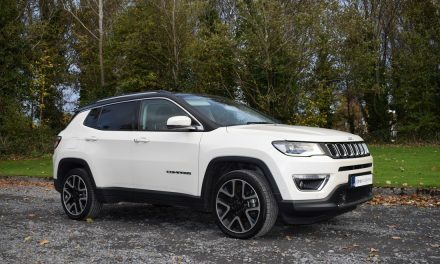 The raised windscreen ‘header rail’ deflects airflow over the cabin so effectively that you can cruise on the motorway and remain untroubled by buffeting. The front element of the AIRCAP® system – a wind deflector with perfused net in the windscreen frame – can be switched to either on or off. Meanwhile, the small – electrically operated – draught-stop between the rear head restraints, has three positions: retracted, half extended and fully extended. In the lower position, AIRCAP® is deactivated. When the AIRCAP® button is pressed, the system adopts the middle position, in which case the front occupants enjoy the full benefit of less driving wind, while rear visibility is not impaired. 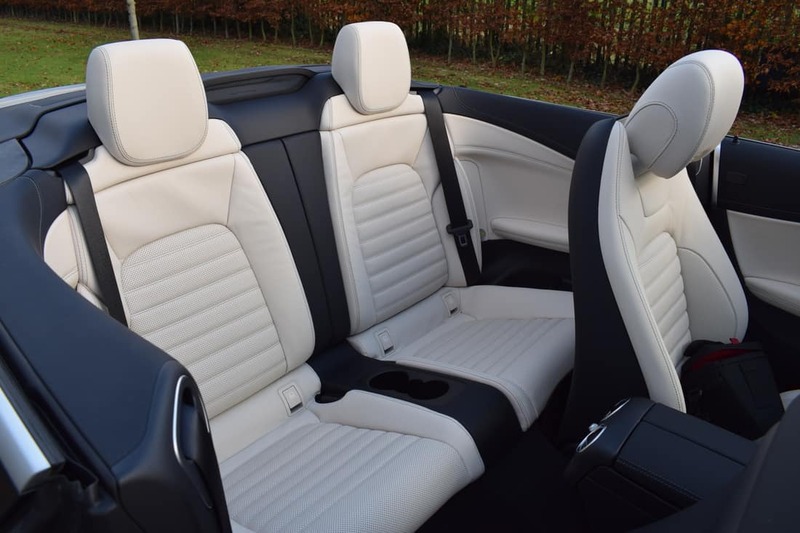 If at least one of the rear seats is occupied, the head restraint and draught-stop move to their highest positions, meaning that even the rear passengers enjoy better protection from the wind than passengers in conventional cabriolets. Additionally, the wind deflector module can also be extended when the roof is up, for cleaning purposes, thanks to a special switching system. When AIRCAP® is activated, not only is there less draught, meaning increased comfort, the interior noise level is also reduced substantially – all passengers therefore find it much easier to communicate with each other. Engines in the new C-Class Cabriolet consist of petrol or diesel, and the range is largely similar to the new C-Class Coupe’s. All models are rear-wheel drive, although 4MATIC four-wheel drive is available as an option on the C 220 d and is standard on the AMG 43. All but the lowest spec models come with automatic gearboxes. 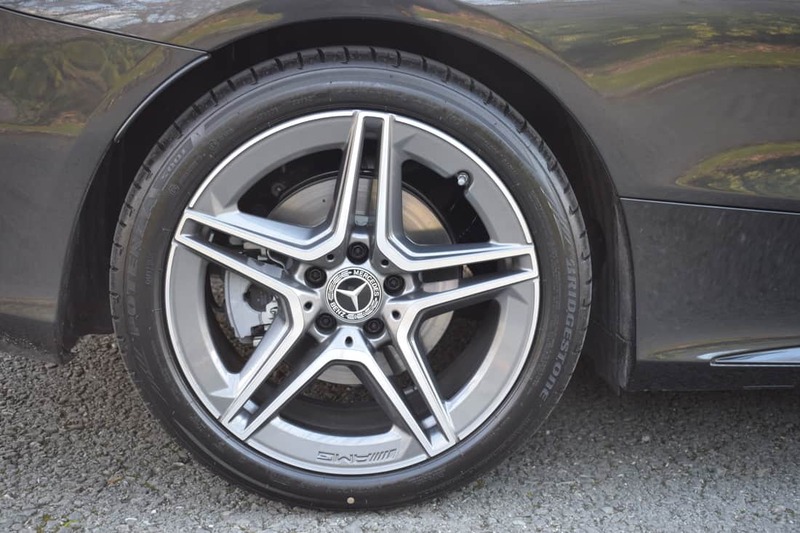 My test car was a new Mercedes-Benz C200 (1.5-litre petrol) ‘AMG-Line’ Cabriolet Automatic finished in Graphite Grey metallic paint with luxurious leather seating in Porcelain (beige/cream colour) for maximum impact. Standard equipment is hugely impressive and includes stunning AMG 5-spoke alloy wheels, AMG bodystyling kit consisting of an AMG front apron with sporty air intakes and chrome trim element, AMG diffuser-look rear apron with insert in black and AMG side sill panels, AMG sports pedals in brushed stainless steel with black rubber studs, diamond radiator grille with pins in chrome and integrated Mercedes-Benz star, folding rear seat backrests, 3-spoke multifunction sports steering wheel in black Nappa Leather with flattened bottom section, belt feeder for driver and front passenger, Cabrio Comfort Package (AIRCAP® and AIRSCARF®), interior light package, roof lining in black fabric, AMG floor mats, heated seats, LED high-performance headlamps, ‘Mercedes-Benz’ laurel wreath badge on bonnet, reversing camera, perforated front brake discs and front brake calipers with ‘Mercedes-Benz’ lettering, sports suspension with ‘Sports Direct Steer’, electric windows front & rear, folding exterior mirrors, trim elements in open-pore black ash wood with light longitudinal-grain aluminium, keyless start & stop button along with many other luxury features befitting of the Mercedes-Benz premium brand. 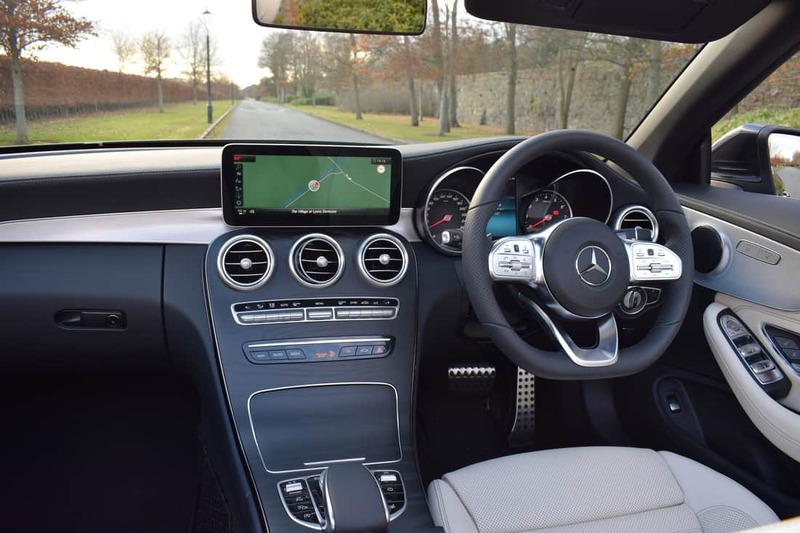 Optional extras fitted to my test car included an ‘Advantage Package’ (consisting of a ‘parking package’, ‘mirror package’, Mercedes-Benz Navigation and a 10.25” infotainment display), Smartphone integration, and upper level of dashboard and door beltlines in ARTICO man made leather. The steering in the new C-Class Cabriolet is direct and well weighted, while offering excellent grip. Mercedes has done an excellent job in strengthening the car’s body-shell during its transition from coupe to convertible. 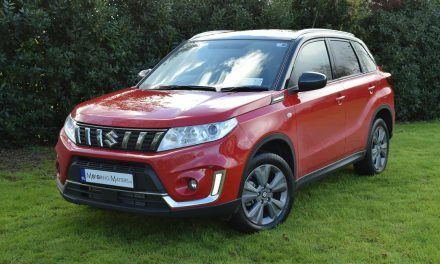 As a result, road bumps and uneven surfaces fail to upset the car’s composure, while the overall ride quality is terrific. State-of-the-art Mercedes-Benz ‘Intelligent Drive’ assistance systems support the driver more effectively than ever. Pulling away in traffic queues, situation-appropriate enhanced braking power (if the risk of a collision is identified), maintaining a safe distance on the motorway at speeds of up to 210 km/h – they’re all areas in which the new C-Class can help the driver today. It’s hard to imagine a more reliable and attentive partner for your journey. The petrol engine in my test car is capable of a 0-100km/h sprint in just 7.9-seconds, leading to a top speed of 239km/h (where permitted). 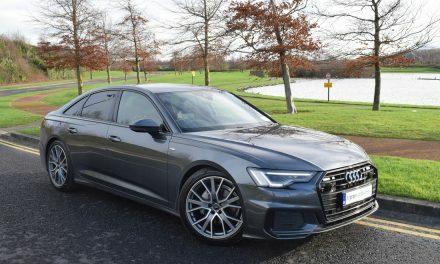 Producing a healthy 184bhp, along with 280Nm of torque, the 1497cc engine is capable of consuming as little as 6.4-litres of fuel for every 100km’s driven on a combined driving cycle, while a Co2 emission figure of 145g/km translates to annual road tax of just €390. 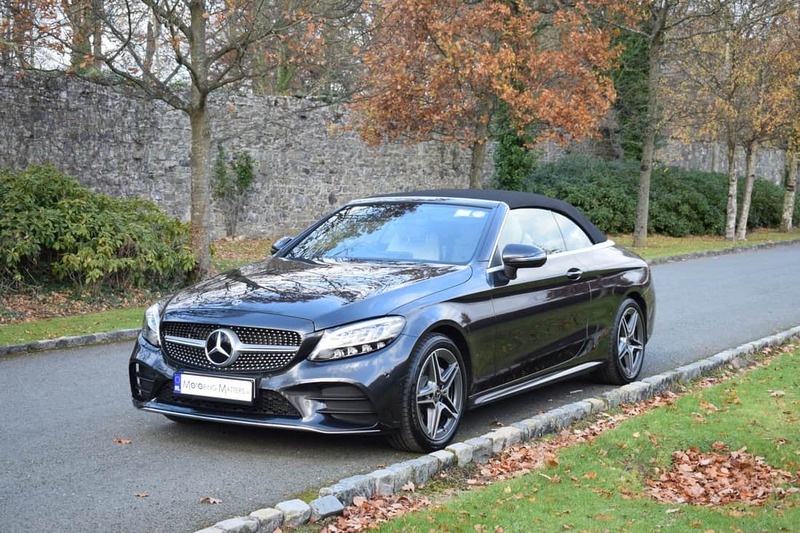 The new C-Class Cabriolet combines an eye-catching exterior design with a beautifully executed interior, making it the plushest car in its class. The car stands out from the crowd with its combination of swooping lines and graceful detailing. 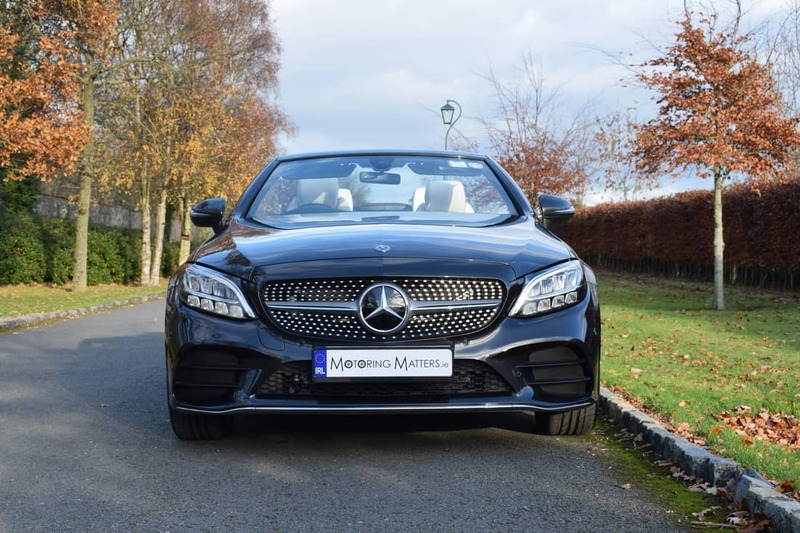 The front of the C-Class Cabriolet AMG-Line is dominated by a ‘diamond pin’ effect grille which houses some of the sensors for the electronic driving aids, and there is a pair of LED headlamp clusters with distinctive daytime running lights. The curved rear of the car, with its slender lamps, completes the ultra-stylish look. Inside, the car has the same upmarket feel as the new C-Class saloon with plenty of metal switches and high-grade plastics throughout. 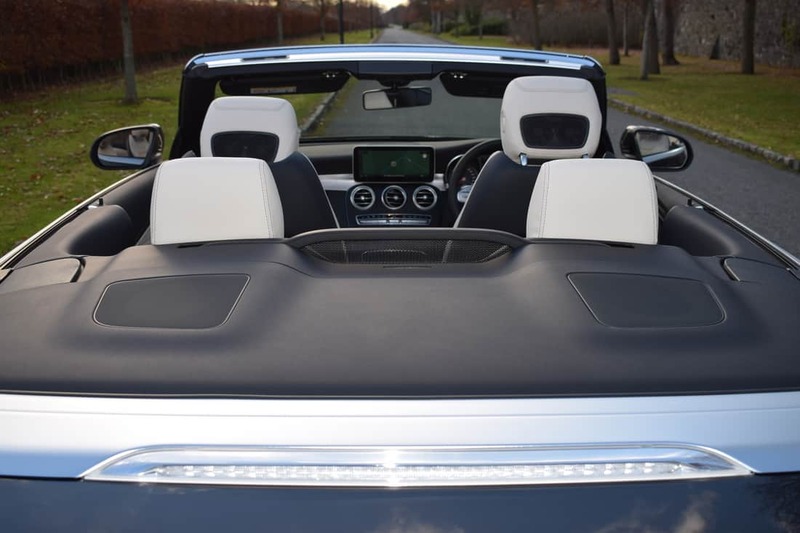 The familiar Mercedes-Benz tablet-style infotainment screen sits on top of the dash, controlled via the COMAND wheel ahead of the central armrest, and the Cabriolet adds a bank of three switches behind that for the roof, AIRCAP® and four-window opening controls. The, front headrest-mounted, AIRSCARF® neck heater is also included, as are heated seats – both of which are controlled by switches located on the driver and passenger doors. Many control and display elements are brand new: the new steering wheel with Touch Control buttons and, depending on the specification chosen, fully digital instruments and enlarged displays including a new generation infotainment system enable highly individual, cutting-edge operation. Depending on the equipment you can illuminate and animate all instruments in ‘Traditional’, ‘Sporty’ and ‘Progressive’ display styles. 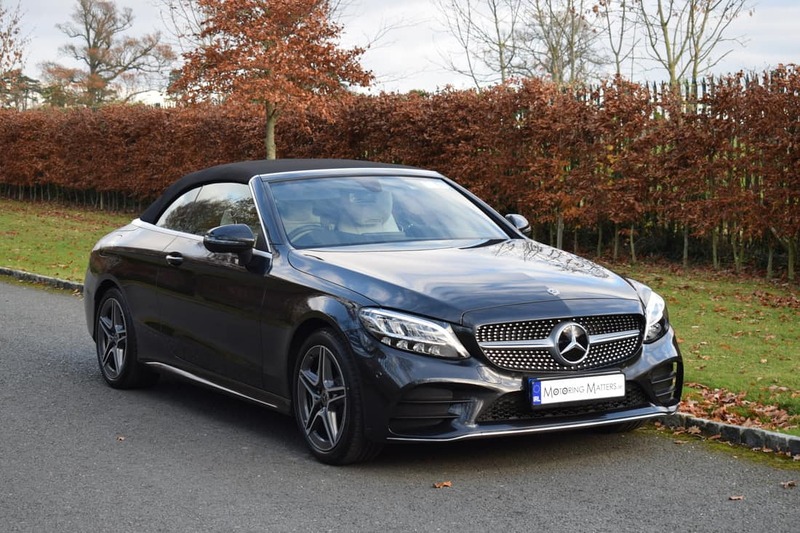 The Mercedes-Benz C-Class Cabriolet is built on the same platform as the C-Class Saloon, so a five-star Euro NCAP rating is applicable across the entire new C-Class range. Seven airbags come as standard, while rollover protection is also deployed if the unthinkable should happen. 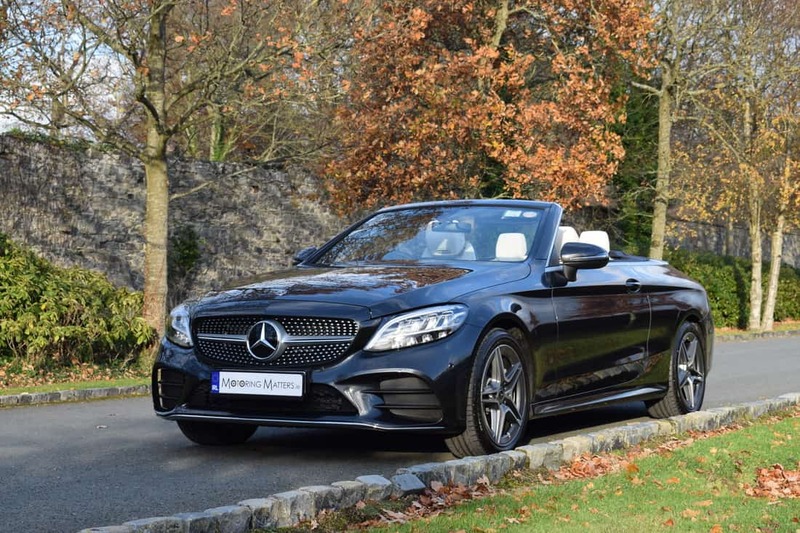 With ex-works prices starting at €50,575, the stunning new Mercedes-Benz C-Class Cabriolet is a very comprehensive 4-seat luxury convertible in every way. 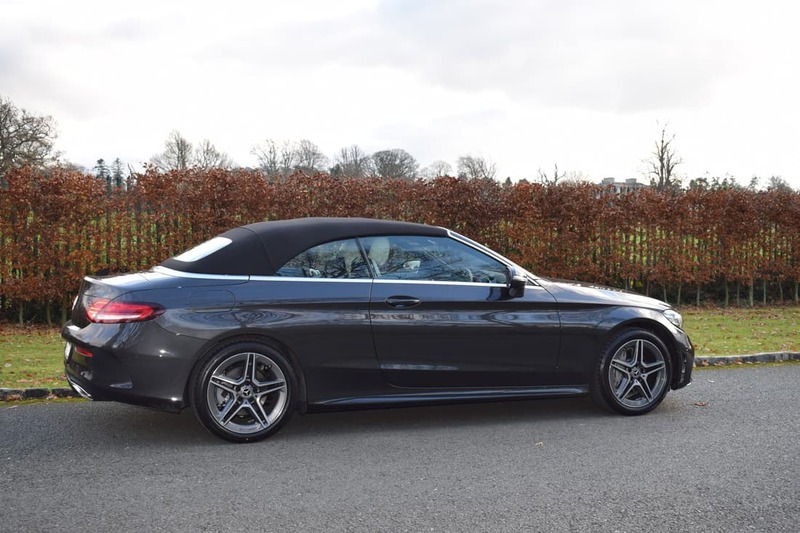 Offering huge levels of refinement, along with the use of high quality materials, the new C-Class Cabriolet offers the ultimate upmarket driving experience – with the roof up, or down. 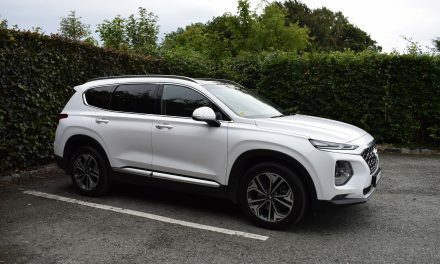 PreviousNew Jaguar E-PACE 2.0D AWD ‘First Edition’ Review.